I have two rules in the about TV for my daughter. (1) No watching TV from Monday through Thursday. (2) No turning to watch commercials when someone else is watching a program. I’ve imposed rule #2 in spite of –perhaps because of– the fact that I once worked in advertising. I appreciate the fact that it is the commercial material that pays for the content in the media. But since Media Buying and its cousin Media Planning is quite a science, with a wicked –often desperate — streak parents need to be vigilant. It is not accidental that advertisers deliberately place family unfriendly message in family programs. Few know that such a thing as product placement (and such things as ‘adver-games‘) exist to “regain the attention of consumers who can avoid advertising (by) using digital video recorders” etc. I cannot begin to count how many parents have told me how they have had to do something about preventing their pre-teen son or daughter seeing trailers of movies that have a rating of PG-17 or higher. Because my wife and I are in education, we are constantly asked about how to deal with the problem. But while we rail against TV, let’s not forget the Internet could also be an equally bad influence when children use it unsupervised. My first response is usually a question: “Do you have a TV in the bedroom?” If the answer is yes, then there is no rule on earth (no filter good enough) that could reduce the impact of the problem. 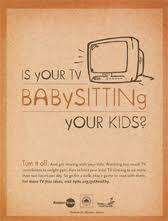 A recent study in Britain found that nearly 8 out of 10 children watch TV by themselves for two hours a day. My second question is related to how many hours of TV or internet. The typical answer is “Oh, about 2 hours a day…” Two hours of passive entertainment may seem benign, but it is really two hours of training a young brain to accept information with no critical perspective, no time to reflect on what is presented. Worse, it trains young children to not use alternative sources of information, entertainment, relaxation. (Libraries, trees, sleep!). But in the end, rules and timers will not be enough. What we need to do is teach our children some basic Media Literacy. Not in some academic way about theories of Marshall McLuhan or Neil Postman (Amusing ourselves to death). What’s needed is a way for parents to be able to tell their children that much of what they see and hear on television was designed to not make them think; that game shows and reality shows are far removed from reality –life simulated on studio sets. And that the emotions displayed in very realistic programs are planned, edited, and the people have been screened and coached. Sadly, in the British study cited above, 66% of parents didn’t even know the characters or story lines of the shows their kids are watching. 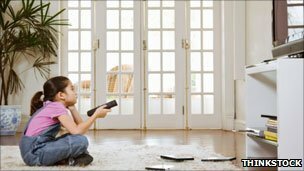 Experts who say TV for kids is not so bad recommend ‘co-viewing,’ but in that study 20 percent of parents who co-view approximately “sit in silence with their children.” Other studies have linked television watching to behavioral health problems. Indeed Media Literacy is hard, especially when it is easy to turn on the videos in the back seat of the SUV and keep the kids quiet and have an undisturbed chat on your bluetooth. Take a cue from the American Academy of Pediatrics which says media education for children could counter the negative effectsof watching violent TV. Pediatricians have linked food marketing and obesity –an increase of 12 percent with one hour, increasing by 4 to 5 percent for each additional hour. (May 2011 report). A rudimentary lesson on media literacy would be a good start for children 4 and up. But it needs to be updated every six months. Later on, when the children grown up and you are fighting the deeper problems of over-sharing on social media, and sexting, you will be thankful you did!